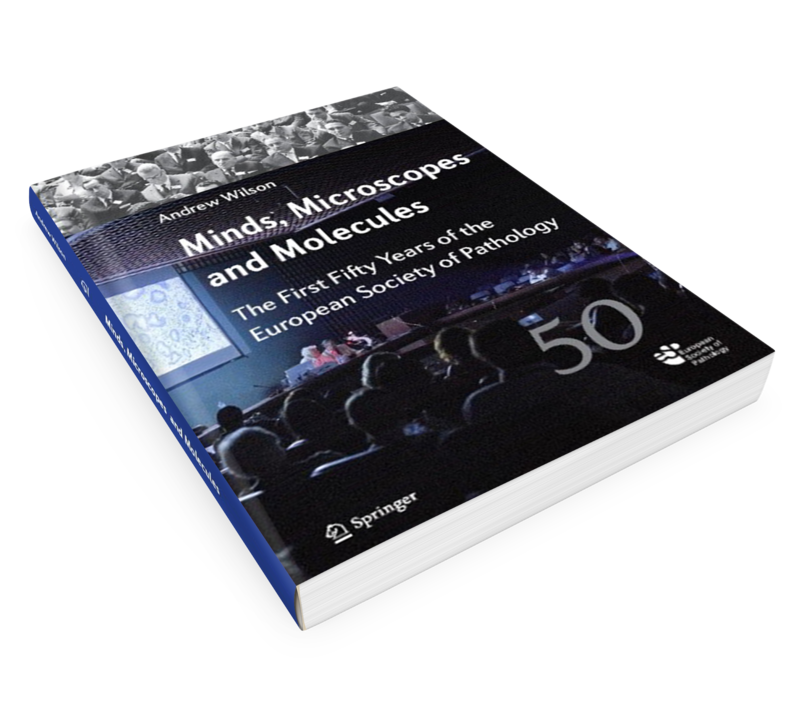 In 2016, the ESP published Minds, Microscopes and Molecules: The First Fifty Years of the European Society of Pathology (Springer, 262 pages). Set against a backdrop of scientific, political and social change, it features over 140 historical photos, and was drawn from interviews, published sources, the Societies’ archives and the contributions of many ESP members. The European Society of Pathology (ESP) was created in 1964 by a small group of eminent practitioners. During the early years, the Society’s officers struggled to build its membership, hold well-attended and scientifically interesting Congresses, and publish a scientific journal, while coping with the political and social changes that shaped Europe. By the end of its first century, in the year 2014, it had become a highly respected professional organization with its headquarters in Brussels, a respected and profitable journal (Virchows Archiv) and a wide range of educational activities. The story is divided into six chapters, which are summarized here. The Society was established following correspondence between the Italian Alfonso Giordano and a group of pathologists across Europe in 1963. 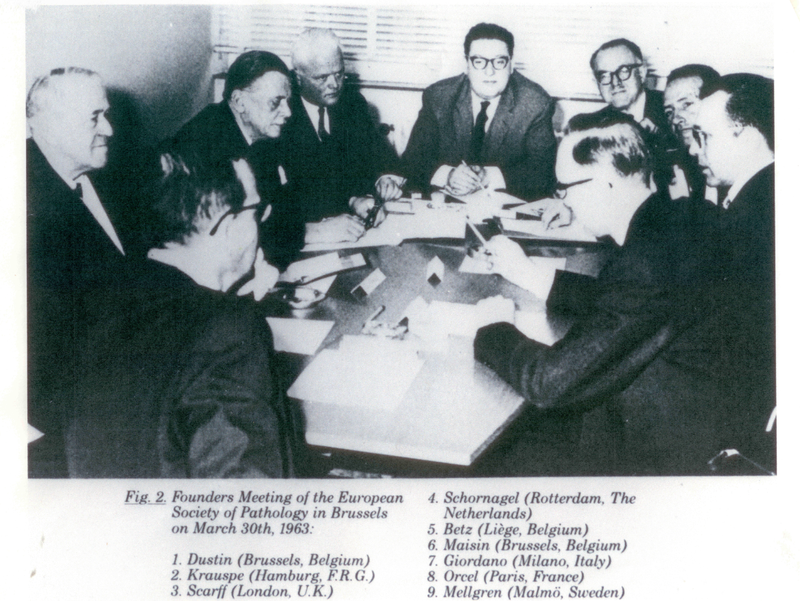 The first meeting of nine “founding fathers” (see photo) was held in Brussels at the Pathological Service of the St. Pierre Hospital on 30 March 1963. The meeting voted the Belgian Pierre Dustin to be its first president for a four-year term, and began work on statutes. Europe was defined as the entire continent including the “eastern” (i.e. communist) countries, and English was adopted as the working language. The Society’s official launch was in Salzburg on 7 November 1964. An official journal, edited by Dustin and called Pathologia Europaea, was launched in mid-1966, and the first Congress was held in Warsaw on 1 June 1 with about 200 pathologists from around Europe attending. This period saw slow growth in membership and an ongoing struggle to keep Pathologia Europaea going. After small and rather lack-lustre Congresses were held in Zurich (1969 – moved from Athens due to the April 1967 coup d’état) and Castrocare Terme (1971), the 1973 Congress in Budapest seemed to turn the Society’s fortunes around, and was followed by successful Congresses in Vienna (1975) and London (1977). The first woman President, Alexandra Piringer-Kuchinka, served a four-year term from 1971 to 1975, and was followed by Christian Nezelof (1975-79). In 1978, Pathologia Europaea ceased publication and was replaced as the ESP’s official journal by Pathology Research and Practice. Under President Christoph Hedinger, the ESP officer’s elected terms were reduced to two years, except for the Secretary and Treasurer. A regular newsletter, European Pathology, began to be produced several times a year. Limited participation by eastern European pathologists from eastern European countries led to an attempt to increase membership from these countries, which remained a challenge for the next two decades. The first Working Groups were formed. Successive Presidents noted external challenges that threatened the profession’s boundaries, the Society created a committee to investigate and promote pathology education across Europe. This period was marked by the fall of the Iron Curtain and the expansion of the European Union. It also saw the only cancellation of an ESP Congress when the 1991 Ljubljana Congress could not go ahead due to fighting as Yugoslavia began to break up. The period also saw massive changes gathering speed in medical organization and management, as well as technological change in the field of pathology. As an organization, the ESP had to modernize, introducing more professional accounting and administrative practices, though still without an office or paid staff. There was increasing involvement with the European Union “machinery”, notably the European Union of Medical Specialists (UEMS), and attempts to standardize pathology training though these did not in the end succeed fully. Much more successful was the creation of three ESP-related “schools”: EuroCellPath, the European School of Pathology (EScoP), and the Ioannina University Post-Graduate Courses (IUCP). In 1999, Pathology Research and Practice was replaced as the Society’s official journal by Virchows Archiv. In the first decade of the millennium, the ESP held a number of “Inter-Congresses” and Intercontinental Congresses in addition to the biennial Congresses. In response to growing sub-specialization in pathology, Working Groups increased in number and in their scope of activity. The organization of the Society received two blows, first when the 2001 Berlin Congress barely broke even (most Congresses were important sources of ESP income, shared with the host national society) and second when the General Assembly at the 2003 Congress was unable to agree on a new president. The latter crisis was resolved by postal ballot, and led to changes in the Society’s statutes and “ground rules”, notably after the adoption of a 21-Point Plan for organizational renewal in 2006. The Society’s financial health massively improved in the same year when a profit-sharing arrangement was negotiated with Virchows Archiv publisher Springer. The ESP finally gained a physical home in 2008 when it bought office space at 6 rue Bara near Brussels-Midi/Zuid Station. The offices also served as a training space following the purchase of video-microscopy equipment. In the same year, the Society moved towards direct involvement in medical practice when it began an External Quality Assurance (EQA) programme, beginning with KRAS mutation testing across the European Union. The Society also began to increase its influence within the machinery of European Union on issues such as tissue “biobanking” and EU support for research. Partnerships were initiated with other medical and scientific societies, notably those dealing with biomedical research and cancer research and treatment. At its 2014 “50th Anniversary” Congress in London, the Society could announce that it had over 3,000 members, assets of €2.2 million, and 19 Working Groups in fields from breast pathology to uropathology. The Brussels office is the current repository of the Society’s archive, and most of the physical documents cited in this book can be consulted there. For access, please get in touch with the Brussels office. In the interests of readability, and because of the sheer volume of documentation, Minds, Microscopes and Molecules: The First Fifty Years of the European Society of Pathology did not provide detailed footnoting or referencing. A fully referenced electronic copy of the text is available at the ESP headquarters in Brussels. It is hoped that this annotated text may eventually be available on the Society’s website. History of the ESP: Article by Dr. L. Kaklamanis on the 50th Anniversary of the ESP in 2013.